The sun sets over Narrow Water Cay. Monday evening, April 30, the sun finally shone down on us for the first time in four days. All around we saw people emerge from their boats, bask in the sunâ€™s rays and dinghy ashore. As the day came to an end cameras pointed westward, documenting this occasion as the brilliant orb slowly sunk below the horizon. 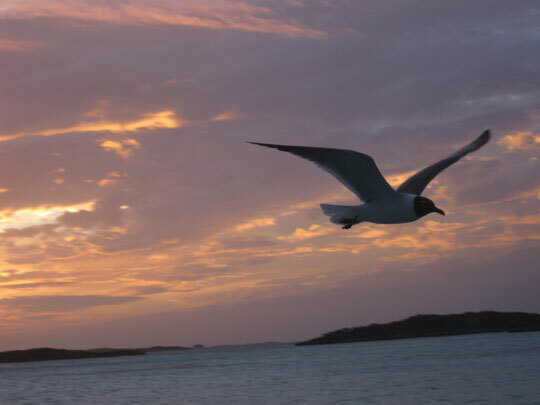 We had left Hawksbill Cay early that previous Saturday morning under grey skies and headed towards the Exumas Land and Sea Park Headquarters at Warderick Wells Cay. Although we were rained in some of the wild life came to us. 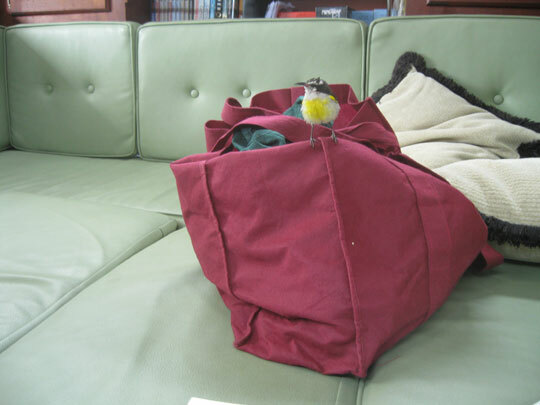 This bananaquit flew in the boat. It was kind of sweet and fun, until we were shoing at least one or two of these birds out of the boat everyday. 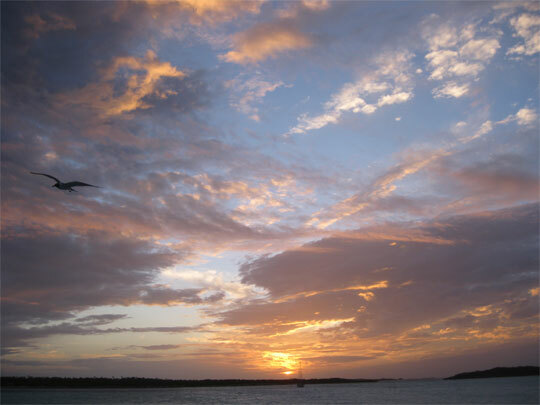 The Exumas Land and Sea Park is 176 square miles of land and water set aside by the Bahamian Parliament in 1958 as a protected area. 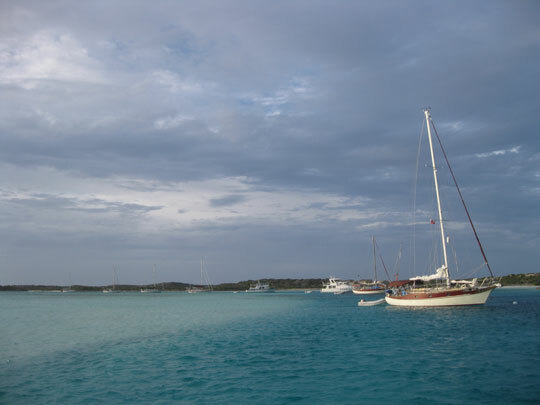 The park stretches 22 miles from Wax Cay Cut in the north to Conch Cut in the south and extends around 4 miles on either side of the 15 large islands and many tiny ones in between the two cuts. Warderick Wells is the home to the parkâ€™s headquarters. It is crisscrossed with numerous trails wandering through many different kinds of flora and habitats. For snorkelers, it is surrounded by wonderful reefs. It is rich in history of shipwrecks, pirates, ghosts, and loyalist settlers. There are two mooring fields in the park assigned to boaters by the parkâ€™s office. They do not take reservations. The moorings are only available on a first come first server basis. When you arrive, if all of the moorings are already occupied, you can be put on a waiting list. Some people just have to get out no matter what the weather. It helps to have a good set of rain gear. Upon our arrival at Warderick Wells we anchored beside Emerald Rock, not the calmest of anchorages, in between the north and south mooring fields. This is the only anchorage available near the cay. We called the park on channel 9 on the VHF and put Blue Wingâ€™s name on the waiting list for a mooring the next day. Once settled we dinghied into the parkâ€™s headquarters to check out the museum/gift shop/video rental/book exchange (all one place). After conversing with the woman behind the desk we realized that there were moorings free that day. I looked out the window at the available ball. It looked much more pleasant than where we were anchored, so we decided to spend the $15 for the mooring and move Blue Wing. Some lessons you just have to learn over and over. Since we had just arrived at the island hours before and had already navigated around the shallow water we would need to avoid getting to the mooring field, we felt like we could visually pilot the boat to the park headquarters. We got a little lost. Our GPS is old and hard to use, but entering waypoints and using them as guides to travel from place to place is an excellent way to avoid sailing or motoring into waters sure to put us aground. After figuring out where we were entering waypoints in the GPS and getting back on course we arrived at the mooring field. It is actually more like a mooring horseshoe. Mooring balls float in the middle of a narrow channel of water in a U shape nestled in between Narrow Water Cay to the west and Warderick Wells Cay to the east. Unlike how you would normally approach a mooring ball to pick it up, from the lee side, you had to approach these from the windward side, the middle of the channel. We can give no advice on the best way to do this except that you really donâ€™t want to screw up, the channel is very narrow, the current is stronger than it appears, and the shallows are very shallow. Half of the horseshoe of boats. Note the sandbar behind the boats. We made it to the mooring field in time for the Saturday night meet and greet happy hour, but it was raining, we were exhausted, and Greg, the mooring ball snagger, was bleeding (nothing serious). We settled down for the evening, glad to be in our new spot which was much more restful and settled than anywhere we had been for days. The next day the wind blew and it rained. We hunkered down below deck only to go out once to the headquarters to pay for our mooring, get some ice and trade some books. On our third day in Warderick Wells it poured in the morning. I looked out from under the dodger and saw a few stir-crazy souls ashore in their rain suits. Greg took the opportunity to scrub the boat down. It was cold and I dug out my jeans. Greg finished a book heâ€™d gotten the day before. I read and worked on blog posts. It seemed as if we would live in this gloom forever when the rain stopped, the wind slowed down a little and the thick canopy of clouds hovering over us parted revealing a glimmer of hope and the warm Bahamian sun. Even the birds were happy about the sun. This one took the oppurtunity to fly from boat to boat begging as people came out on deck to marvel at the big ball of light in the sky. 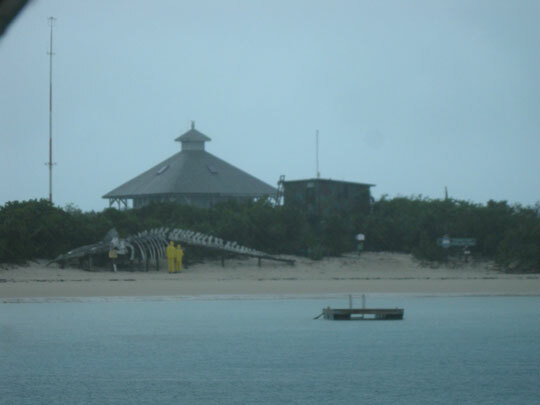 This entry was posted in Life on the Water, The Bahamas, The Exumas and tagged Exuma Cays Land & Sea Park, Rain, The Bahamas, The Exumas, Warderick Wells, Warderick Wells Mooring Field. Bookmark the permalink.